9 x 12 Poster Frame SwingFrame This Poster Display Frame 9x12 from SwingFrame is a high quality, functional wall poster frame that swings open for quick change of posters, graphics, photography and other printed signage. There's no other poster display like it. a patented quick change frame system that features a traditional style custom metal picture frame with a decorative beveled matboard. This combination presents a classic 9" x 12" picture frame look that can fit into any interior environment; retail, corporate or institutional – all industries and markets. Whether your projects require a small 8.5x11 frame or a large poster frame: 24x36, 36x48 or even larger, with over 35+ wall mount poster frame sizes available you'll find a Classic Poster SwingFrame to fit your display framing project needs. Custom frame sizes and finishes available. Snap Open 9 x 12 Poster Snap Frames and Sign Frames are popular quick-changing, print display frames that allow you to effortlessly change posters and signs. All four sides of the snap frames are spring-loaded to "snap-open". Snap poster frames also known as “clip frames” and poster grip frames are easy to install to the wall. 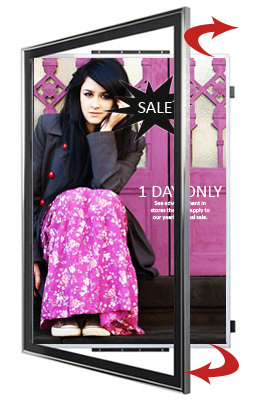 The aluminum snap frame easily snaps shut and provides posters with a tight, even and wrinkle free grip. 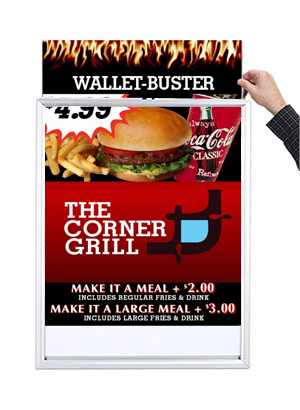 Poster snap frames are used for many signage applications in retail stores, corporate facilities, institutions and as point of purchase display frames. With over 35+ standard snap frame sizes, whatever poster size you have, we have a snap frame for it. And if you require a custom snap frame size, we'll build it. 9 x 12 Top Load Frames are wall poster display frames and signage frames that allow you to drop your poster from the top. The thin 5/8" frame hugs the wall and is designed with a hidden slot to quickly change your posters. Easy to use and install, this economical poster top load frame has a 1" wide beveled metal frame profile and comes in popular black, silver and gold finishes. Top Load Frames accept mounted posters and signs up to 1/4" thick and for thin poster sheets a backing board and protective clear overlay are available as an option. Changeable Top Load poster frames can also be ordered as a Side Load. Over 35+ poster frame sizes, small and large come standard with custom frames for posters available. Also take a look at our Top Load Wood Poster Frames and Top Load Euro-Style Poster Sign Frames. SwingFrame is a division of Access Display Group, Inc. located on Long Island, New York, the company designs, fabricates and assembles all SwingFrame branded products and fixtures in its Freeport LI facility including patented swing-open poster display frames and other wall and floor stand display, display cases and retail fixtures. Display products are distributed to all industries and marketplaces throughout North America. Swing-open display products include; metal and wood poster display frames, wall mounted poster displays, poster holders, poster stands, sign holders, graphic display holders, enclosed bulletin board display cases, cork board displays, changeable letters board display case, enclosed letter board frames, metal and wood newspaper frames, elevator frame displays, restaurant menu displays, menu cases, letterboard directories, large shadow box cases, and enclosed dry erase marker boards. SwingFrame Mfg. also designs and builds illuminated poster displays, poster cases, and lighted shadow boxes. 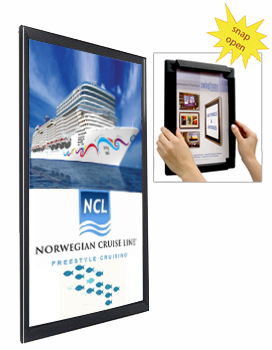 Lightboxes are another line of popular displays offered with the latest in lighting technology. These wall mounted poster light boxes include thin LED light boxes, backlit light boxes and edge-lit light boxes. All frames and fixtures displays are built to order including our line of economical poster display frames and sign frames. These quick change frames include wall mounted top load frames and poster snap frames, the front loading snap open clip frames that are popular for large volume sign and poster holder projects. Outdoor displays include weather proof, lockable display cases that include; outdoor menu display cases, outdoor poster cases and outdoor bulletin board display cases. SwingFrame Mfg. continues to design and present new display products and offers direct online buying on the company’s website www.displays4sale.com.